For the 2011 American remake of this crime drama, see The Killing (U.S. TV series). The Killing (Danish: Forbrydelsen) is a Danish police procedural drama television series created by Søren Sveistrup and produced by DR in co-production with ZDF Enterprises. It was first broadcast on the Danish national television channel DR1 on 7 January 2007, and has since been transmitted in many other countries worldwide. The series is set in Copenhagen and revolves around Detective Inspector Sarah Lund (Sofie Gråbøl). Each series follows a murder case day-by-day. Each fifty-minute episode covers twenty-four hours of the investigation. The series is noted for its plot twists, season-long storylines, dark tone and for giving equal emphasis to the stories of the murdered victim's family and the effect in political circles alongside the police investigation. It has also been singled out for the photography of its Danish setting, and for the acting ability of its cast. The Killing has proved to be an international hit—garnering significant critical acclaim—particularly in the United Kingdom, Germany and The Netherlands, receiving numerous awards and nominations including a BAFTA Award and an International Emmy. It has become something of a cult show. Novelizations of each series have been published by Macmillan. In 2011, a US remake was produced by the American cable network AMC. Søren Sveistrup, series creator and head writer, worked closely with lead actress Sofie Gråbøl throughout the writing process to successfully develop the character of Detective Inspector Sarah Lund. Gråbøl, in particular, became eager to defend her character. Gråbøl had a history of playing emotionally demonstrative characters on Danish television—she had worked with Sveistrup before on the TV-series Nikolaj og Julie—he approached her direct to play the part of Sarah Lund before work on the script began. Despite her insistence that she wanted to play an "isolated person [who is] unable to communicate" Gråbøl initially found it difficult to strike the right balance for the emotionally-distant Lund and then realised that the only people she knew, who were like the character, were men. As a result, she began "acting like a man" until the character took shape. During filming of the first series Sveistrup also refused to reveal the identity of the murderer or even specific plot points to members of the cast, including Sofie Gråbøl. The actors would receive the scripts only on an episode-by-episode basis just moments before shooting was scheduled to begin. Only Gråbøl was told that she was not the killer. The first series consists of 20 fifty-minutes episodes, which follow the police investigation into the murder of a young woman from its commencement on 3 November to its conclusion on 22 November. The first ten episodes were shown on DR1 each Sunday from early January to the middle of March 2007 and the intention was to show the remaining ten episodes in January–March 2008; however it was so popular in Denmark that in early March it was announced that the final ten episodes would be brought forward to the autumn of 2007; they were shown from late September to late November 2007. Detective Chief Inspector Sarah Lund is in her last day with the Copenhagen police force; about to move to Sweden to join her fiancé and transfer to the Swedish police. Everything changes when 19-year-old Nanna Birk Larsen is found raped and brutally murdered. Sarah heads the investigation and is teamed up with her replacement, Detective Inspector Jan Meyer. Troels Hartmann, politician, is in the midst of a hard-fought mayoral campaign when evidence links him to the murder. The girl's family and friends struggle to cope with their loss. Over a span of 20 days suspect upon suspect is sought out as violence and political pressures cast their shadows over the hunt for the killer. Forbrydelsen II is set two years later and consists of ten episodes. It aired in Denmark between 27 September and 29 November 2009. Episodes were screened eleven days later on Thursdays on Norwegian NRK1. It was shown on German TV channel ZDF and on Swedish SVT in the autumn of 2010. In the United Kingdom, it was shown on BBC Four, starting from 19 November 2011, following the success of the first series, on the Belgian channel, Canvas, starting on 25 November 2011, and in Australia on SBS Two, starting from 21 March 2012. The Region 2 DVD with English subtitles was released on 19 December 2011. Lund, now demoted to the border guard, is called back to Copenhagen to help in solving the murder of Anne Dragsholm, a military adviser found murdered in Ryvangen Memorial Park. Lund suspects that the murder is not as straightforward as it seems, despite the forced confession of Dragsholm's husband. Meanwhile, Thomas Buch, the newly appointed Minister of Justice, suspects that his predecessor was involved in the cover-up of a massacre of Afghan civilians by Danish soldiers, and that this incident is connected with the murder. Lund is about to be discharged from the case when a second killing, that of a Danish military veteran, leads to fears that Islamic extremists are involved. Jens Peter Raben, a sectioned war veteran, knew both victims and tells his story of the execution of an Afghan family by a special forces officer named "Perk". Raben escapes, and two other members of the unit are murdered. Suspicion falls on senior military officers, including Raben's father-in-law, Colonel Jarnvig. Buch and his secretarial team uncover further evidence of the cover-up, but the cabinet pressures him to continue pinning the murders on Muslims in order to assure the passage of an anti-terrorism bill. Raben takes refuge in a church presided over by a former army chaplain, who tries to convince him to give himself up and stop investigating the killings. Lund discovers the chaplain's body and pursues the perpetrator. She arranges for the exhumation of Perk's body. When Lund and her partner, Inspector Ulrik Strange, catch up with Raben, he calls out Perk's name before Strange shoots him. An injured Raben persists in accusing Strange of being the officer responsible for the massacre, yet it is later officially confirmed that he had left Afghanistan before the killings. Lund is uneasy about Strange's alibis for the murders, but takes him with her to Afghanistan to investigate a new suspect. Lund's persistence results in the discovery of the bones of the Afghan civilians. Upon returning to Denmark, Lund meets her mother, who has had a premonition of Lund lying dead. Following a further search of a military barracks, suspicion falls on Captain Bilal, an anti-Taliban Muslim who kidnaps Raben's wife Louise. Raben and Jarnvig lead Lund and Strange to Bilal, who blows himself up before they are able to question him. Strange volunteers to return Raben to the mental hospital, but Lund insists on driving them. On the way, they make a stop at the scene of Dragsholm's murder, where Lund points out to Strange the reasons why Bilal is unlikely to have been involved. Strange gives himself away by revealing a detail that only the murderer could know, and confesses to the murders before shooting Lund with her own gun, which he then plants on Raben. He phones the police and is about to shoot Raben when Lund hits him over the head. When Strange tries to retrieve his gun, Lund shoots him dead. As the police arrive at the scene, Lund walks away and removes the bullet-proof vest she had been wearing. 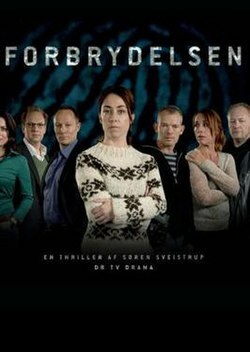 Forbrydelsen III, premiered on Danish television on 23 September 2012. It commenced on NRK1 in Norway on Monday 8 October 2012, with an audience of 436,000. Series 3 on BBC Four in the UK began on 17 November 2012 with 1.04 million viewers. This final ten-part series begins with the murder of a sailor. Sarah Lund's investigation turns to the financial and governmental communities during the global financial crisis. Lund is now a Chief Inspector but has ambitions for a new lifestyle. As a parent she is struggling to repair her relationship with Mark. She has to cooperate working with a new Inspector Asbjørn Juncker and Mathias Borch of Special Branch when Emilie Zeuthen—9-year-old daughter of Robert Zeuthen—is kidnapped. Lund, Juncke and Borch hunt down the perpetrator while the government is on the verge of collapse. Figures for the UK broadcast of episodes 1 – 8 do not include the ratings for BBC HD. In the wake of the successful Wallander series, The Killing became another Scandinavian crime hit with British viewers when it was shown on BBC Four in the spring of 2011. Although subtitled, it attracted more viewers than Mad Men, scored audience appreciation figures of 94%, and has been described as "the best series currently on TV". The success has created an interest in all things Danish, and the female detective's Faroese jumper has been the subject of newspaper articles as well as becoming a sought after online item. "It's the first time you have a detective drama over 20 episodes – other series had one killing per episode. And we also have this three-plot structure – what does it [a murder] mean for a police investigator, what does it mean for the parents, what does it mean for the politicians. It's not just about finding the murderer. That's important, but it's not all." The Killing has been awarded a number of awards and recognitions from various festivals and organisations from around the globe since it began in 2007. Because of the time lapse in air dates between countries, honours awarded to the first two series are spread out over an unusual number of years. In the UK, the first series won the 2011 BAFTA award in the "Best International" category. It was also nominated for the Audience Award but lost to reality show The Only Way is Essex. The second series was again nominated for "Best International" in 2012, but lost out to fellow Danish programme Borgen. Following both its critical and ratings success in the United Kingdom, the BBC began importing and broadcasting more subtitled programmes from a number of different countries. In 2012 the popular Danish drama Borgen and the more popular joint Swedish-Danish venture The Bridge both aired on BBC Four with similarly high viewing figures, while in the same year ITV3 also acquired the original TV2 series Those Who Kill. In late 2011 digital channel Sky Arts also broadcast the Italian series Romanzo Criminale, while FX bought the rights to popular French cop show Braquo. Although BBC Four had shown subtitled dramas before, notably the Swedish version of Wallander and French police procedural Spiral, controller of the channel Richard Klein described The Killing as "a game-changer". Vicky Frost of The Guardian noted how it was The Killing which "paved the way for a wave of subtitled European crime dramas" appearing on UK television, while head of programming at FX Toby Etheridge also confirmed his belief that "The Killing proved it was possible [to successfully show subtitled drama]". Instead of broadcasting the original series, a US remake of The Killing was produced by Fox Television Studios for the American cable network AMC. It premiered on 3 April 2011 and ran for two seasons before being cancelled on 27 July 2012. However, on 8 November 2012, it was confirmed that Fox Television Studios were in final negotiations with Netflix in order to continue the series for a third season. AMC, who had originally cancelled the show, was also included in part of the deal. The deal in question gives the network the privilege of airing the new episodes before they are hosted by Netflix in return for sharing any associated production costs with Netflix. The original US production team are expected to return. A fourth season, consisting of six episodes, was produced by and is available on Netflix. On 8 April 2011, Sofie Gråbøl, the star of the Danish series, was interviewed on the BBC Radio 4 programme Woman's Hour, when she explained the American remake was necessary because Americans "for some reason cannot read subtitles, or they don't want to." Gråbøl herself has made a guest appearance in one episode of the American show playing a minor role. A novelization based on the first series and titled The Killing: Book One was published by Macmillan in 2012. The book was written by British author David Hewson. This was followed by The Killing: Book Two in January 2013, and The Killing: Book Three in February 2014. ^ a b "The Killing (2011–2014)". IMDb. Retrieved 27 January 2011. ^ Anthony, Andrew (13 March 2011). "The Killing: Meet Sofie Gråbøl, star of the hit Danish crime thriller". The Observer. London. Retrieved 17 August 2012. ^ This refers to the original date of broadcast on DR1 and DR HD. ^ "TNS Gallup TV-Meter". TNS Gallup (in Danish). Archived from the original on 19 February 2014. Retrieved 15 October 2012. ^ This refers to the original date of broadcast on BBC Four. ^ "BARB". Broadcasters' Audience Research Board. Retrieved 1 July 2012. ^ "Forbrydelsen II". IMDb. Archived from the original on 6 September 2011. Retrieved 27 January 2011. ^ "Forbrytelsen 2". NRK (in Norwegian). Retrieved 14 December 2011. ^ "Kommissarin Lund: Das Verbrechen II". ZDF (in German). Archived from the original on 25 January 2012. Retrieved 21 March 2011. ^ "Svåra fall för dansk polis". SVT (in Swedish). Archived from the original on 9 October 2012. ^ Sutcliffe, Tom (21 November 2011). "The Weekend's TV: The Killing II, Sat, BBC4 Frontline Medicine, Sun, BBC2". The Independent. Retrieved 21 November 2011. ^ Daniels, Colin (5 March 2011). "BBC buys second series of The Killing". Digital Spy. Retrieved 21 March 2011. ^ a b "The Killing – Het programma". Canvas.be (in Dutch). Archived from the original on 29 November 2011. Retrieved 3 December 2011. ^ Knox, David (5 March 2012). "Returning: The Killing". TV Tonight. Retrieved 27 May 2012. ^ "The Killing II out on DVD 12 December 2011". Close-Up Film. Archived from the original on 22 November 2011. Retrieved 21 November 2011. ^ "Forbrydelsen II". Settet.dk. Archived from the original on 30 January 2016. Retrieved 21 March 2011. ^ a b "TV ratings". TNS Gallup. Archived from the original on 19 February 2014. Retrieved 25 November 2012. ^ "Forbrydelsen III". IMDb. Archived from the original on 12 December 2011. Retrieved 27 January 2011. ^ "Forbrytelsen 3". NRK (in Norwegian). Retrieved 7 October 2012. ^ Henriksen, Arve (9 October 2012). "Farmen knuste Forbrytelsen". Aftenposten (in Norwegian). Retrieved 22 October 2012. ^ Plunkett, John (19 November 2012). "The Killing is back with a bang". The Guardian. Retrieved 25 November 2012. ^ "Finanskrisen rammer Forbrydelsen III". DR (in Danish). Retrieved 17 November 2012. ^ Kennedy, Emma (17 December 2012). "The Killing III: was this really a fitting end for Sarah Lund?". The Guardian. Retrieved 18 December 2012. ^ "The Killing (DK) Season 3 starts on 17 Nov 2012". YouTube. 2 November 2012. Retrieved 5 November 2012. ^ Frost, Vicky (4 March 2011). "The Killing, a slow-moving drama with subtitles, is a hit for BBC". The Guardian. Retrieved 21 March 2011. ^ Midgley, Neil (5 March 2011). "BBC Four buys second series of The Killing". The Daily Telegraph. Retrieved 21 March 2011. ^ Jarossi, Robin (6 March 2011). "Why The Killing is the best thing on television – 10 reasons". CrimeTimePreview. Retrieved 21 March 2011. ^ Dent, Grace; Booth, Hannah & Fox, Imogen (19 March 2011). "Danmark – hvor det sker! Or... Denmark – where it's at!". The Guardian. Retrieved 21 March 2011. ^ Heminsley, Alexandra (21 February 2011). "Sarah Lund's Faroese jumper is the surprise star of BBC4's The Killing". The Guardian. Retrieved 21 March 2011. ^ Kirby, Emma Jane (28 April 2012). "The Killing and Borgen: Danish drama wins global fanbase". BBC News. Retrieved 17 August 2012. ^ "Dansk drama går så det suser". NRK (in Norwegian). 12 October 2012. Retrieved 22 October 2012. ^ "Forbrytelsen". NRK (in Norwegian). Retrieved 13 December 2011. ^ "Rikos – Sarjaopas". Telvis.fi (in Finnish). Archived from the original on 20 July 2011. Retrieved 5 March 2011. ^ "Brottet". Discshop (in Swedish). Retrieved 13 December 2011. ^ "SBS One Sydney Schedule: Wednesday 17th February, 2010". SBS Television Online. Retrieved 22 September 2011. ^ "The Killing". BBC Four. Retrieved 19 September 2011. ^ van Soest, Thijs (28 March 2012). "The Killing komende zomer elke dag op Nederland 2" [The Killing every day on Nederland 2 this Summer]. de Volkskrant (in Dutch). Retrieved 8 August 2012. ^ "Forbrydelsen". SoHo TV. Retrieved 31 July 2012. ^ "The Killing Saison 1". Arte. 16 August 2012. Archived from the original on 2 February 2016. Retrieved 5 November 2012. ^ "Serije: Novice". Podnapisi.Net. Retrieved 9 May 2015. ^ "Television Awards Nominees and Winners in 2011 – Television". British Academy of Film and Television Arts. 22 May 2011. Retrieved 23 May 2011. ^ "Television Awards Winners in 2012 – TV Awards – Television". British Academy of Film and Television Arts. Retrieved 17 November 2012. ^ Jones, Paul (27 January 2012). "Is it The Killing? Is it Borgen? No, it's Those Who Kill". Radio Times. Retrieved 17 August 2012. ^ a b Frost, Vicky (18 November 2011). "The Killing puts torchlight on subtitled drama". The Guardian. Retrieved 17 August 2012. ^ "The Killing cancelled by AMC after two seasons". Digital Spy. 27 July 2012. Retrieved 2 December 2012. ^ Andreeva, Nellie (8 November 2012). "AMC and Netflix Near Deal To Resurrect 'The Killing'". Deadline Hollywood. Retrieved 1 December 2012. ^ Andreeva, Nellie (30 November 2012). "Dawn Prestwich & Nicole Yorkin To Return To 'The Killing' As Executive Producers". Deadline Hollywood. Retrieved 1 December 2012. ^ "Woman's Hour". BBC Radio 4. 8 April 2011. Retrieved 2 December 2012. ^ "The Killing by David Hewson: review". The Daily Telegraph. 5 May 2012. Retrieved 2 December 2012. ^ Hewson, David (2013). The Killing 2. London: Pan Books. ISBN 978-1-44720-842-6. ^ Hewson, David (2015). The Killing 3. London: Pan Books. ISBN 978-1-44724-623-7. "The Killing". BBC. Retrieved 28 February 2011. "Forbrydelsen II". DR. Retrieved 28 February 2011.